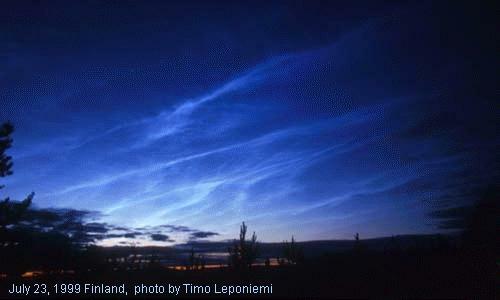 Noctilucent Clouds (NLC) occur at extremely high altitude, about 50 miles (80 to 85 km), and glow at night. They form in the cold (below -200 F), summer polar mesopause and are believed to be microscopic ice crystals. More detail on form classification and diagrams of the four basic forms. 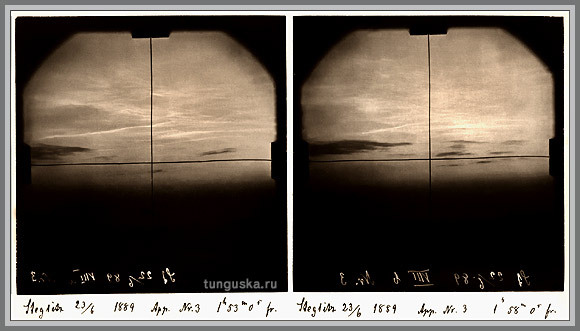 The twilight conditions which render NLC visible, impose a latitude restriction on their visibility. They are, therefore, most often seen from locations which lie between Latitude 50 and 60 degrees in both hemispheres (though they are occasionally reported beyond this latitude band). Through most of June and July (from the northern hemisphere) these locations never attain true darkness and twilight skies persist all night. The latitude range takes in Canada, Northern Europe and Russia. Very few populated land masses exist at the corresponding latitudes in the southern hemisphere. 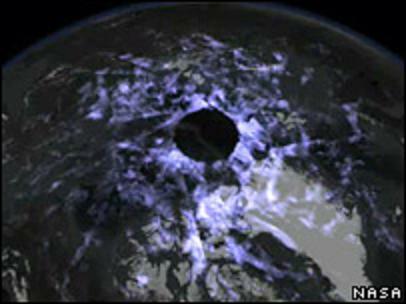 Noctilucent clouds appear to be an extension of a more or less persistent feature of the summer polar mesosphere which is not visible to the naked eye at higher latitudes due to daylight conditions. 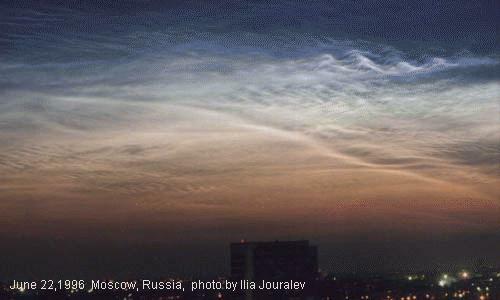 These clouds, observed by instruments aboard satellites, are referred to as polar mesospheric clouds (PMC's). Pekka Parviainen's Polar Image site.